Wait, hang on. I’m having a powerful feeling of déjà vu. Let me start again. Villainous doesn’t feel like a game that should be dissected on a hobbyist website. It’s a bit like being a structural engineer and complaining that the design of a Lego bridge doesn’t take into account the material science necessary for accurately modeled wind resistance. It’s almost certainly true, but you know – that’s not exactly the point of the exercise. Villainous is an obviously mass-market title intended to have obviously mass-market appeal. It’s equally obviously not for us. Not every story has a happy ending though, and in this case Villainous makes the mistake of also being designed like a Michael-seeking missile. It’s a board game. It’s a board game about Disney. 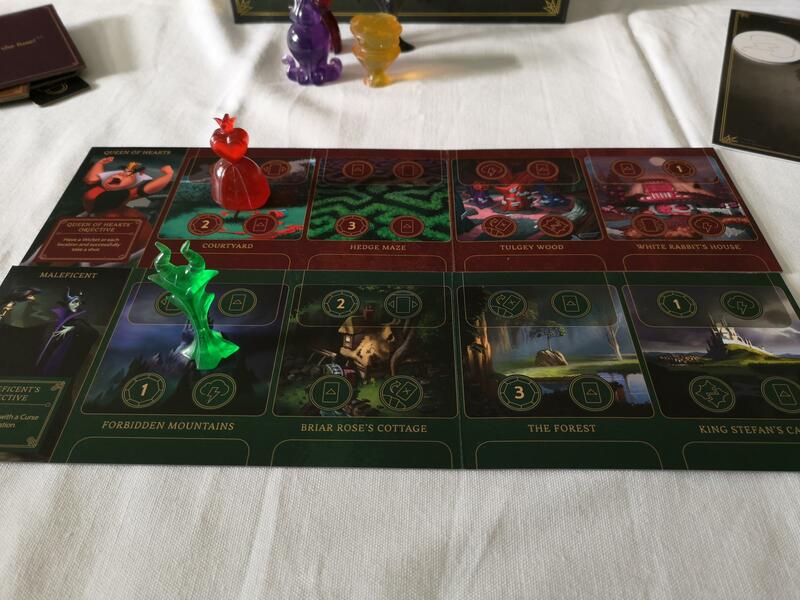 It’s a board game about Disney villains. 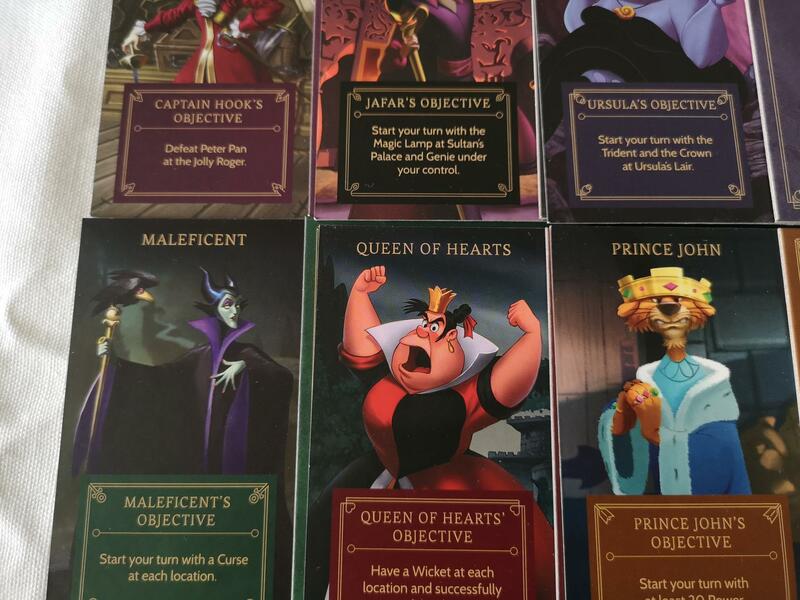 It’s a board game about Disney villains from the consistently best eras of Disney animation. Seriously, there was no way I wasn’t going to buy this. And then, having bought it there was at least a 30% chance I’d actually play it. I love Disney. I know all about their exploitative work practices and their cynical and self-serving relationship to intellectual property laws. I know they have industrialised cultural appropriation in a way that basically makes it impossible for them to be respectful of the source material. I know they have a troubled relationship with the most basic expectations of corporate good practice. I forgive it all because Disney was the back-beat of my childhood. I can’t tell you how many times I watched Aladdin, or Beauty and the Beast, or even the deeply problematic Pocahontas. There’s not a Disney song composed in the period between Sleeping Beauty and The Lion King that I can’t sing all the way through, often to the intense distress of everyone around. And look what Villainous gives us – a roster of characters that doesn’t challenge me to engage with the legion of Disney films that followed after their golden age crashed and burned. This is a Disney game that isn’t aimed at children, relatively few of whom I assume will have met the darker denizens of Disney’s ancient canon. This is a game aimed at the parents of children. There’s no Elsa, or Merida, or Moana. At least, not yet. Instead, we get Jafar from Aladdin (1992). We get Prince John from the troubled classic Robin Hood (1973) – oodelaley! Maleficent from Sleeping Beauty (1959) is here, as is the Red Queen from Alice in Wonderland (1951). Ursula from the Little Mermaid (1989) and Captain Hook from Peter Pan (1953) round out the roster. It’s a selection that will bring smiles of joy to the thirty and forty-year-old, middle-aged nostalgics that believe part of their job as parents is to impart the loves of their own childhoods into those of their children. Not being a parent myself I don’t know how successful that’s likely to be but I think it’s a savvy marketing move from Disney. I’m sure any parent would cringe at the idea of a game that forces them to confront any of the characters from Frozen in a new context. This though means that parents are going to as excited, if not more, than their kids. Since they’re also the ones with the money, that’s a good target for which to aim. I bought it, largely sight unseen, on the basis that I’m perfectly comfortable with people packaging up my childhood and selling it back to me in ever more exploitative forms. Hell, that’s basically the dominant way in which I participate in modern popular culture. Each of the villains within Villainous are designed with an interesting and innovative quirk – they’re entirely independent of each other. Each has their own trials and tribulations encapsulated into a pair of decks that act in opposition. In a real sense, every villain is their own set of game mechanisms. 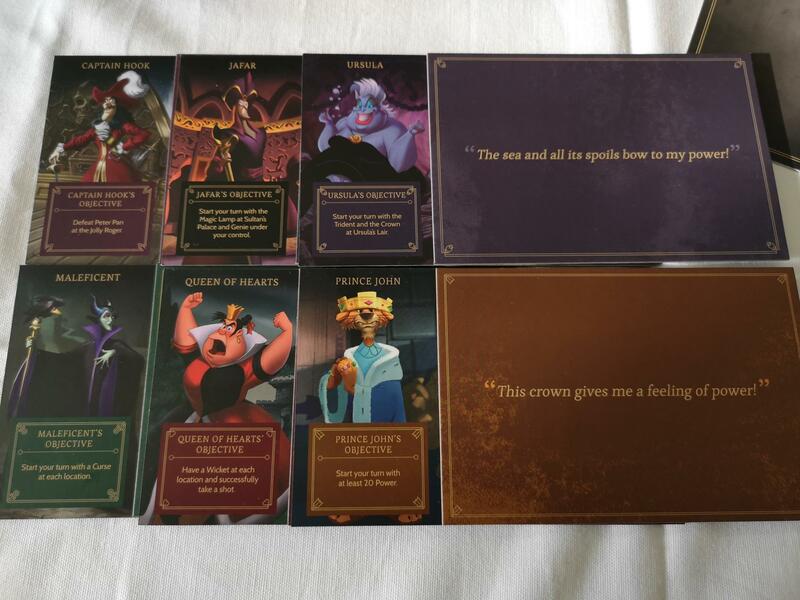 Each villain has a deck of opportunities and powers, and a hand of these cards will be available to progress the game towards their unique objective. They will also have a slimmer fate deck, from which opponents will draw to make their job more complicated. There’s quite a lot of player interaction in this model, but it’s curiously impersonal. It’s like firing a cannonball at a distant island in the hope you startle a conveniently located monkey at a conveniently opportune time. The game loop is very simple. You move your villain to one of the open locations in their realm. 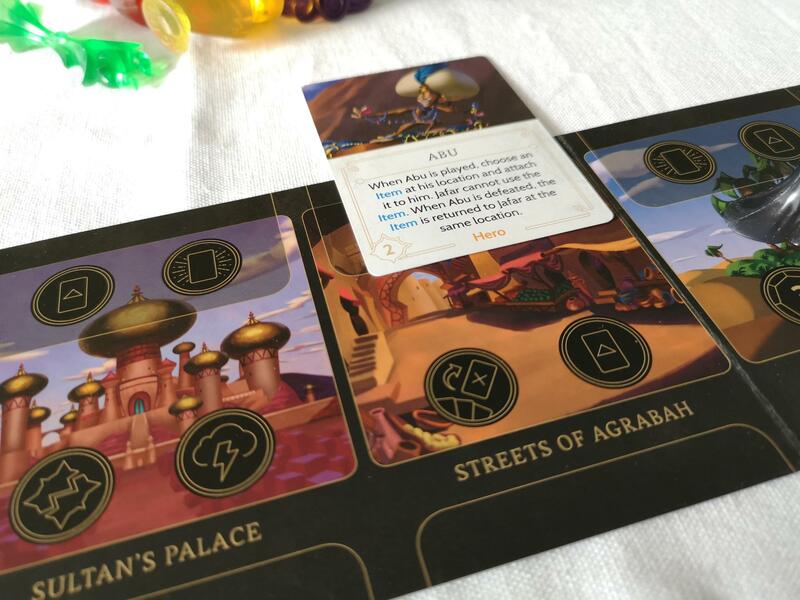 Each location has a number of icons that indicate actions that can be taken – playing cards, discarding cards, and inflicting fate upon a chosen opponent. Some actions set your allies against heroes in their location, so you can see if Aladdin genuinely can keep one step ahead of the hitmen. Others permit you to move allies and items to adjacent locations, or shift heroes to the places that are best set to deal with them. Heroes when played to a location will usually inhibit the powers and abilities of the villain, but they also cover up some of the actions that would otherwise be available when moving to that space. To get those actions back, the heroes must be vanquished. Along the way you need to gain and carefully curate and build sources of power because every card costs you to play. 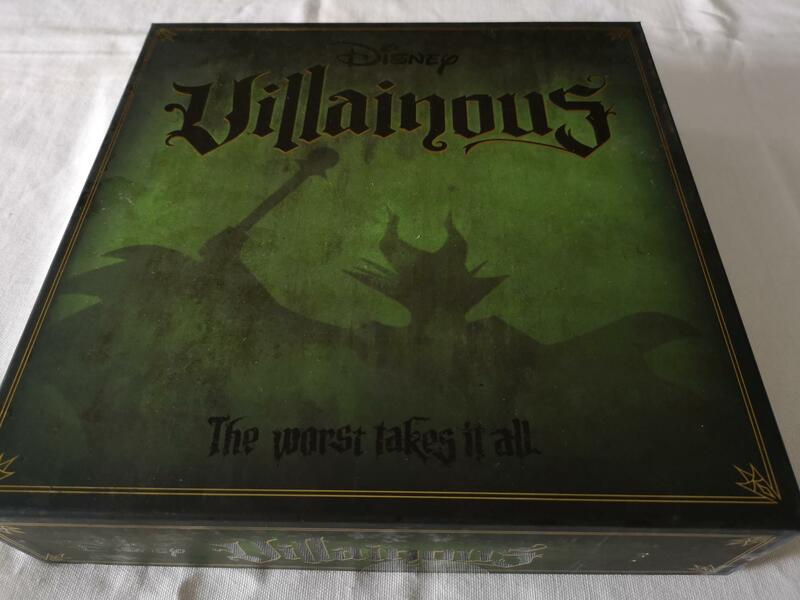 The design of Villainous though is that every board plays differently, and every villain has a different relationship to the locations. The Cave of Wonders for example is locked to Jafar until he finds the Scarab Pendant that opens it. Ursula on the other hand has no ability to vanquish heroes – she must instead inflict a binding contract upon them and manoeuvre them to a set location on her board where they will be conveniently destroyed. She never unlocks locations, she just swaps the lock from one place to another. Prince John has a jail where heroes can be thrown, and there’s no action available for them to block there. Combined with their idiosyncratic win conditions, every single villain has an appropriately thematic feel to play that makes them distinctive. The villain decks too require different approaches and management techniques. Maleficent is all about strewing curses around the landscape, and her fate deck is full of heroes that can undo curses when they enter locations. Jafar on the other hand can hypnotise heroes into becoming his allies, and has scrying abilities that let him search through his deck for specific things he is seeking. Captain Hook has to find Peter Pan, and in fitting with the man himself many of the things he does are acts of self-sabotage aimed at locating and besting his worthy foe. The interaction between the fate and villain decks is essentially a mini tug-of-war – the barrier that your opponents can put in your way are specifically designed to pull you directly away from your objectives just at the point that is most vexing to you. It’s a surprisingly meaty system for a game that looks to be a delivery system for weaponised nostalgia. The villains are so disconnected from each other that it’s the perfect design for facilitating a mini-industry of expansions and bolt-ins. The entire cause and effect of a villain is internalised to their own board. You’re never Jafar throwing curses at the crew of the Jolly Roger, and the Red Queen can never yell ‘off with their heads’ at Flounder and his Little Mermaid buddies. This isn’t a Disney sandbox – it’s more like a paper-doll storybook. That makes the player interaction feel flat, but it also means that new villains don’t introduce exponentially complicating balancing problems as they’re incorporated. I expect to see dozens of villain packs released over the coming years, each sold as a perfectly integratable unit. I can even visualise them hanging in racks in the supermarket games aisles in the same way that D&D miniatures adorn the walls of hobbyist stores. And I can visualise myself buying every one of them because, I don’t know if I mentioned, I love Disney. I don’t love this game, though. The problem here is fundamentally that few of the villains are interesting to play and that’s because there is a chasm between the imagination shown in the characters and the mechanisms to which they’ve been shackled. Ultimately, you never do anything fun except curl up in your own imagination. That perhaps wouldn’t have been true if you could genuinely face villain against villain like some kind of cardboard version of Super Smash Brothers. That’s not possible though, so instead we get insular game mechanisms that are fundamentally too limited to be exciting. Let’s take Jafar for example. First, you need to find the Scarab Pendant, which you do by playing, discarding and drawing cards until it appears in your hand. Then you play that card, which unlocks the Cave of Wonders. 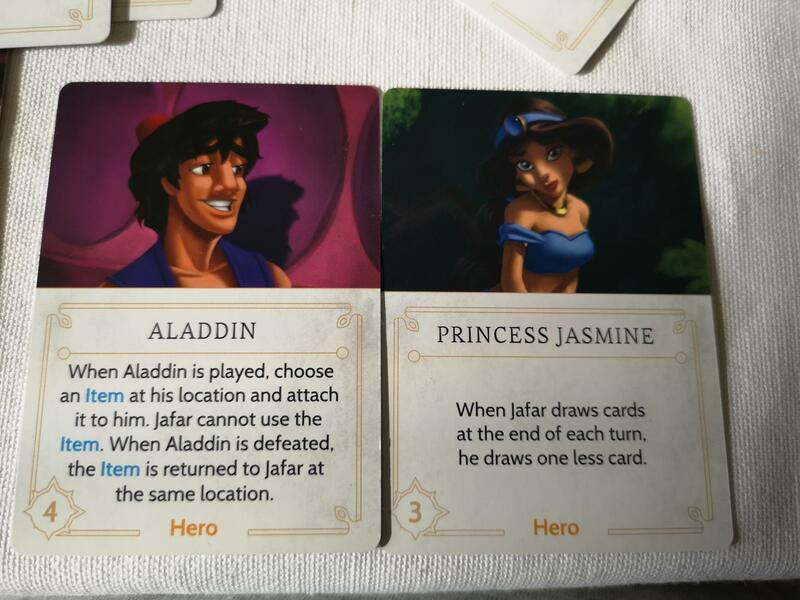 Then you need to find the Magic Lamp, which you do by… playing, discarding and drawing cards until it appears in your hand. Then you play the Magic Lamp to the Cave of Wonders, at which point the Genie appears. You hypnotise the genie to your side, then you painstakingly move the Magic Lamp from the Cave of Wonders to the Sultan’s palace. You win at the start of your next turn. Sounds pretty thematic, yeah? Well, do you know how Ursula wins? She wins by finding the crown, which she does by… playing, discarding and drawing cards until it appears in her hand. Then she needs to find the Trident, which she does by… playing, discarding… you get the point. When she plays the Trident, King Triton then appears. You need to defeat him with a binding contract, and then painstakingly move the Trident from where he dropped it to Ursula’s lair. You win at the start of your next turn. Do you know how Captain Hook wins? It’s not quite the same way but it’s close enough that it makes no difference. The problem here isn’t the similarity, although that’s not great. It’s that these win conditions are boring, marked more by what you can’t do than what you can. 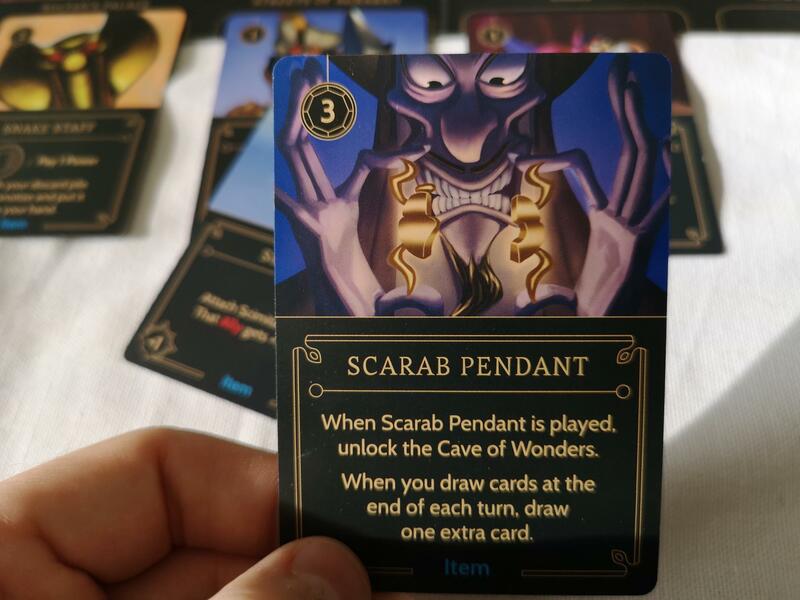 I spent most of my time as Jafar just listlessly discarding cards in the hope that I’d get the scarab pendant because precious little else I could do was of any real value. The first hand of cards I drew contained scimitars for allies I didn’t have, and abilities that let me search through a discard pile that wasn’t there. This lack of energy is compounded by a second major problem, and it’s that these decks are intensely fragile. Items mean nothing if you don’t have an ally to which you can attach them. Effects are useless if there’s no valid target. Reactions (which trigger on an opponent’s turn) are too situational to have clogging up a hand when you really just need to find a specific card to play. The result is that all you end up doing for a lot of the game is top-decking – drawing cards in the hope that this time you’ll get what you want. Similarly with drawing fate for an opponent – the hero powers, items and effects are all deeply contextual, and you’ll get a choice of two you can inflict. You’d best hope that at least one of those two options is relevant at the time you draw the card. 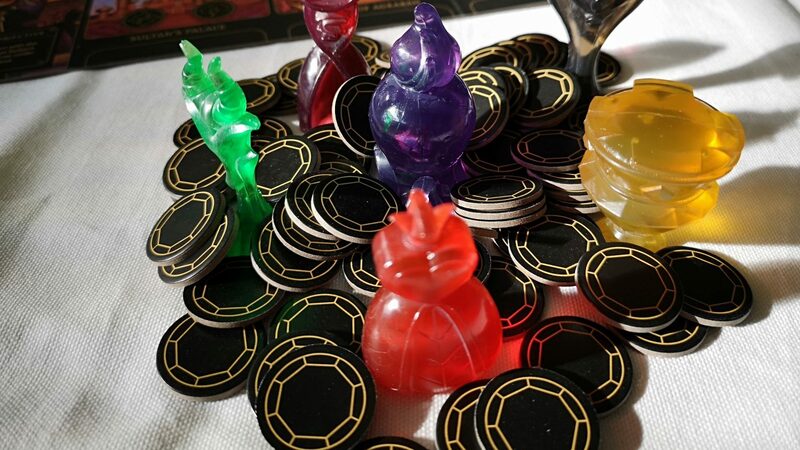 Often in Villainous you’re playing cards just because it doesn’t do you any active harm, rather than because you’re excited to progress your evil master plan. Even with the fate deck, very few things are genuinely show stopping. At best you’re putting down some vaguely burdensome speed bumps, and sometimes even they are on a road the opponent isn’t heading down. The only two villains in this set that feel interesting are Maleficent and the Red Queen. They still have this problem of their decks being built upon the intense fragility of serendipity, but their win conditions permit a lot more scheming and hatching of counter schemes. Maleficent needs to have active curses in each of the locations in her realm, and the hero deck is all about good witches counter-spelling the curses in the location where they enter. That makes it a fun and tense race where everyone else has to manage meeting their own objectives against targeting fate at the Maleficent player because otherwise she’s just going to win. The Red Queen has to get a card guard into each location, have them turn into wickets, and then play a ‘take a shot’ card that will succeed only if she has enough power in her wickets to compensate for her bad aim. Her fate deck emphasises preventing cards being activated, and moving them from place to place. Both of these feel considerably meatier and more intricate than any other villains in the set. 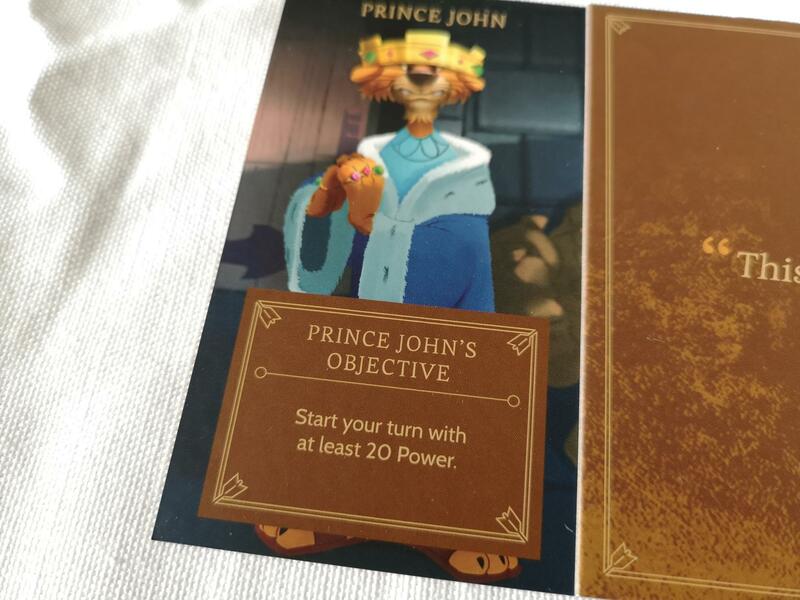 Do you know what Prince John’s objective is? Start your turn with twenty power. It’s exactly as exciting as you’d think. When Mrs Meeple and I played our final game of the evening she was simply accumulating power as a largely passive act. I, as Ursula, was juggling a bound mermaid in my tentacles in the hope that I could get her to the waste disposal system in my lair – not because I needed her destroyed, but because it was something to do. Even that was far less exciting than it sounds, because everything has to be built upon the weak structural foundations of a profoundly limited set of mechanisms. It doesn’t feel any different to move a magic lamp to a palace than it does to manipulate Peter Pan to the Jolly Roger for a Jolly Rogering. 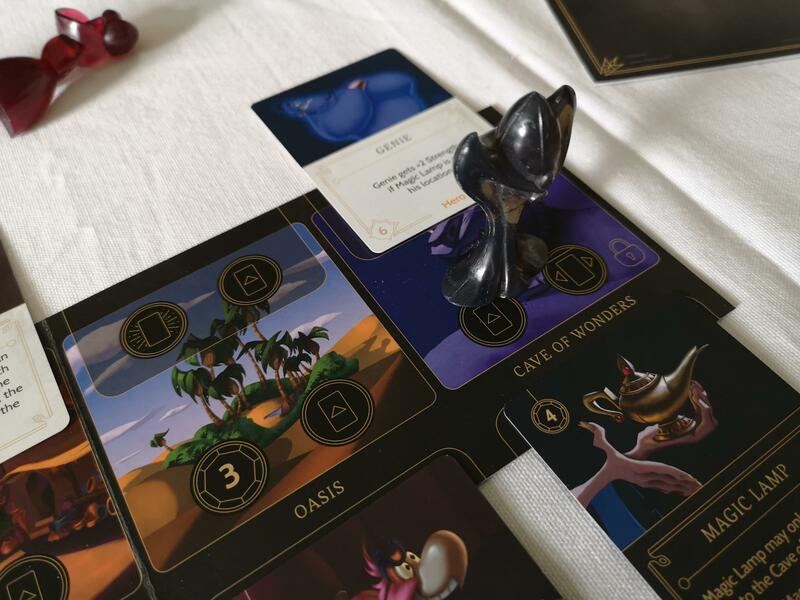 Villainous then feels like a game system that is awaiting someone to design a set of truly interesting villains, but hasn’t provided the tools necessary to make their emergence inevitable. There are moments of inspiration in here, and suggestions of where the design could go in the future. Unfortunately though I think there’s a pretty hard ceiling on how interesting it can get and it’s already been hit with the two best villains in the set. I’m hoping to be pleasantly surprised in the future, but I’m not at all expecting it to happen. Until it happens though, well – the villains are where the entire game lies and most of these villains are just plain boring. I want to like Villainous more than I do, and I want to have more faith in its potential than I can muster. At best I can say ‘I want to love the promise of Villainous in the hope that more creatively designed villains can make me love the game’. I’ll still keep it on my shelf, but had this been themed around anything other than Disney classics I’d already have it packed away for the next Tabletop Scotland bring and buy.